Whats then the science of storing batteries? Learn about storage temperatures and state-of-charge conditions. The recommended storage temperature for most batteries is 15°C (59°F); the extreme allowable temperature is –40°C to 50°C (–40°C to 122°F) for most chemistries. While lead acid must always be kept at full charge during storage, nickel– and lithium-based chemistries should be stored at around a 40 percent state-of-charge (SoC). This minimizes age-related capacity loss while keeping the battery operational and allowing for some self-discharge. While nickel-based batteries can be stored in a fully discharged state with no apparent side effect, Li-ion cannot dip below 2V/cell for any length of time. Copper shunts form inside the cells that can lead to elevated self-discharge or a partial electrical short. (See BU-802b: Elevated Self-discharge.) If recharged, the cells might become unstable, causing excessive heat or showing other anomalies. Li-ion batteries that have been under stress may function normally but are more sensitive to mechanical abuse. The liability for a failed battery goes to the manufacturer when a fault could have been caused by improper use and handling. Finding the exact 40–50 percent SoC level to store Li-ion is not all that important. 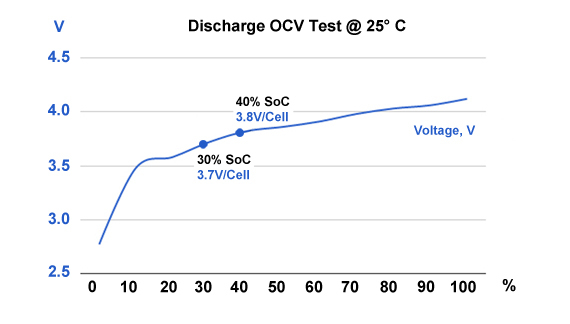 At 40 percent charge, most Li-ion has an OCV of 3.82V/cell measured at room temperature. To get the correct reading after a charge or discharge, rest the battery for 90 minutes before taking the reading. If this is not practical, overshoot the discharge voltage by 50mV or go 50mV higher on charge. This means discharging to 3.77V/cell or charging to 3.87V/cell at a C-rate of 1C or less. The rubber band effect will settle the voltage at roughly 3.82V. Figure 1 shows the typical discharge voltage of a Li-ion battery. Figure 1: Discharge voltage as a function of state-of-charge. Battery SoC is reflected in OCV. Lithium manganese oxide reads 3.82V at 40% SoC (25°C), and about 3.70V at 30% (shipping requirement). Temperature and previous charge and discharge activities affect the reading. Allow the battery to rest for 90 minutes before taking the reading. Measuring SoC is especially difficult on nickel-based batteries. A flat discharge curve, agitation after charge and discharge and temperature affects the voltage. The charge level for storage is not critical for this chemistry, so simply apply some charge if the battery is empty and store it in a cool and dry place. With some charge, priming should be quicker than if stored in a totally discharged state. Table 2: Estimated recoverable capacity when storing a battery for one year. Elevated temperature hastens permanent capacity loss. Depending on battery type, lithium-ion is also sensitive to charge levels. Nickel-metal-hydride can be stored for 3–5 years. The capacity drop that occurs during storage is partially reversible with priming. Nickel-cadmium stores well. The US Air Force was able to deploy NiCd batteries that had been in storage for 5 years with good recovered capacities after priming. It is believed that priming becomes necessary if the voltage drops below 1V/cell. Primary alkaline and lithium batteries can be stored for up to 10 years with only moderate capacity loss. Alkaline batteries are easy to store. For best results, keep the cells at cool room temperature and at a relative humidity of about 50 percent. Do not freeze alkaline cells, or any battery, as this may change the molecular structure. Primary batteries store well. Alkaline and primary lithium batteries can be stored for 10 years with moderate loss capacity. When storing, remove the battery from the equipment and place in a dry and cool place. Avoid freezing. Batteries freeze more easily if kept in discharged state. Charge lead acid before storing and monitor the voltage or specific gravity frequently; apply a charge if below 2.07V/cell or if SG is below 1.225 (most starter batteries). Nickel-based batteries can be stored for 3–5years, even at zero voltage; prime before use. Lithium-ion must be stored in a charged state, ideally at 40 percent. This prevents the battery from dropping below 2.50V/cell, triggering sleep mode. When charging an SLA with over-voltage, current limiting must be applied to protect the battery. Always set the current limit to the lowest practical setting and observe the battery voltage and temperature during charge. In case of rupture, leaking electrolyte or any other cause of exposure to the electrolyte, flush with water immediately. If eye exposure occurs, flush with water for 15 minutes and consult a physician immediately. Wear approved gloves when touching electrolyte, lead and cadmium. On exposure to skin, flush with water immediately.